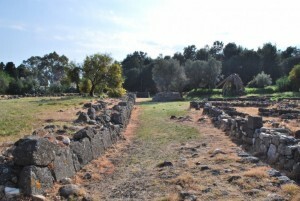 This year’s Sicily trip introduced two new Archaeology days for the first time. As part of the activities, we visited two sites, Aci Castello which is a rather impressive Norman Castle built above a wave cut platform and Giardini Naxos which is the site of the earliest Greek settlement on the island. The trip to Aci Castello helps us to gain an appreciation of the island’s history through an assessment of the museum display at the castle. 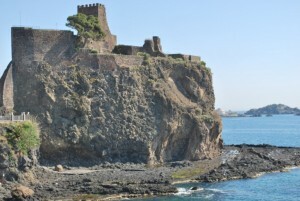 Aci Castello is a strange mix of museum display (including one on Human Origins), succulent botanical garden, viewing platform and art gallery. Once we had examined the castle we headed off to Giardini Naxos (c. 8th century BC)where the students were tasked with a practical exercise in archaeological site mapping. On arrival in Naxos it was a pleasant surprise to find they were in the middle of updating all the museum content with bilingual (Italian and English) information boards attached to QR codes and excellent site maps. When the work is complete the site will truly be a pleasure to visit as well as being extremely informative. Designed to encourage the students to think about two sides of archaeology, including considered questions such as how do you present the finds of the archaeological trench or site to the public in a meaningful way? Do all museums succeed in this task or are there varying degrees of success? When you work on an archaeological site and engage in archaeological activities like site planning why are such activities important and what may their relevance be to the public view of archaeology? The answers to these questions will help keep our discipline relevant in the modern day and I am looking forward to seeing what our students made of their tasks and seeing how Archaeology integrates into the Sicily fieldtrip. This entry was posted in Field trips.